On Monday evening, Morgan Brumm had just stepped outside her family's home in Nebraska when a concerning sound arrived to her ears. Somewhere off in the distance was the unmistakable sound of an animal in distress. "I hear this horrible cry," Brumm told The Dodo. Her mother had heard it as well, but she was too worried by what she might find if she tracked down the source. Brumm, however, knew she had to act. "I headed into our backyard on a trail we always go down and I see a mama deer to my left. She sees me and runs away," Brumm recalled. "I remember that there is a well nearby. So I walked towards it not really knowing what I was gonna see. I peeked in a bit and only saw one head. I thought, 'All right, I can do this.' I took another step forward and saw three. I was blown away." Brumm had found three trapped fawns in desperate need of help. 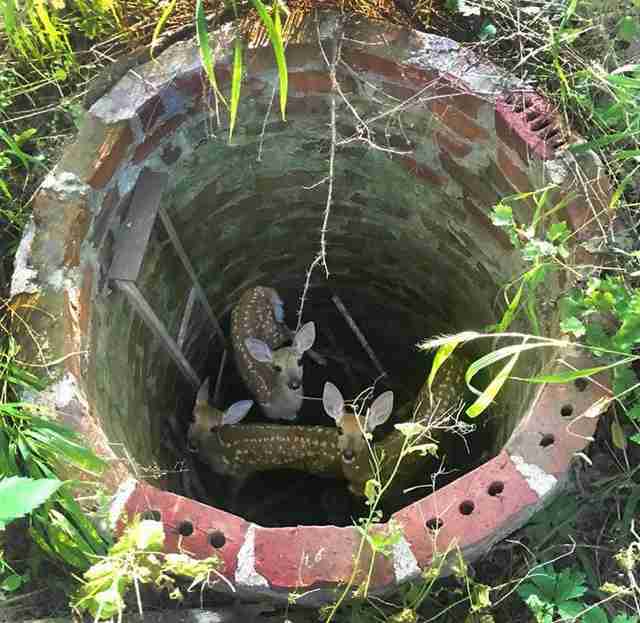 How the young deer babies ended up 8 feet down inside the unused well was anyone's guess. Were they born there? Did they each fall in? One thing was certain, however — they wouldn't be able to make it out on their own. Brumm wanted to save them, but she couldn't do it by herself. "I called my best friend's dad to see if he could come down and help," Brumm said. "He came within five minutes, laid next to the well and pulled all three babies out." Brumm's friend's dad has chosen to remain anonymous, but his good deed was captured on video. However long the fawns had been down there, they were fortunate to still have the energy to get quickly on their way. "They all ran away and we are hoping they are reunited with their mama," Brumm said. "We are looking out because we’d love to get a picture for everyone that they are back together." As for knowing that the fawns are now safe? "It feels pretty great," she said. The well has since been covered to prevent mishaps like this one from happening again.